Item # 299110 Stash Points: 197 (?) This is the number of points you get in The Zumiez Stash for purchasing this item. Stash points are redeemable for exclusive rewards only available to Zumiez Stash members. To redeem your points check out the rewards catalog on thestash.zumiez.com. Stay in the know with all things skateboarding with Thrasher Magazine's September 2018 issue. 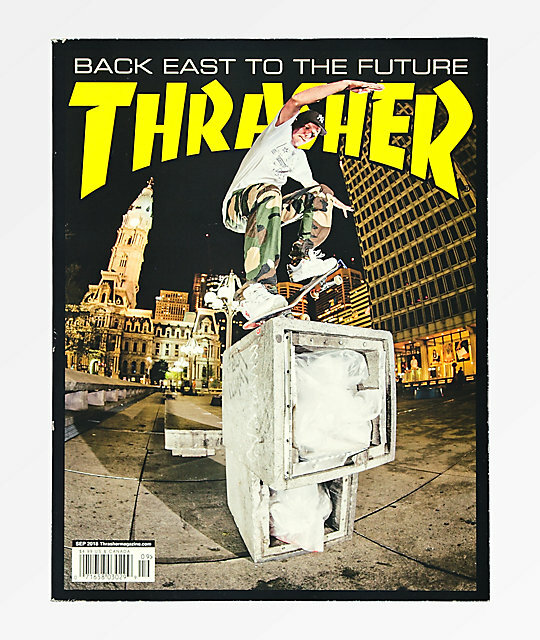 This month's cover displays legendary Josh Kalis showcasing raw street skating through a magnificent noseblunt at Philadelphia's iconic Thomas Paine Plaza. Inside you'll find coverage on the Girl Skateboard's Amateur Team, an extensive article on the DC footwear team and much more!